Steve ,I havent seen it in person but looked nice in pics and on auction live feed , is there issues you have seen on it? I would think $125g for a car like that is a deal,what in your opinion is it worth as I take it you have inspected it in person to see any issues? The body and paint are extremely nice on the car. Wheel openings seem a bit on the small side. 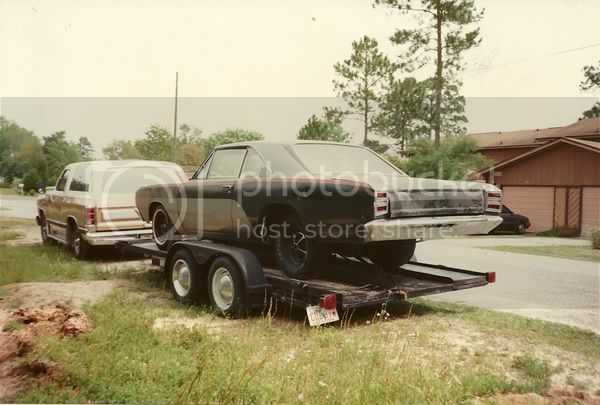 I'm guessing the car had full quarters possibly put on, as it was converted to a '70-72 body after THT sold the car. It doesn't appear that the openings were cut using a template off an untouched car. Aside from that, look at this picture and go from there. The car needs some more attention to detail to get in the stratosphere of other cars. Hood hinges gotta go , other than that seems like a very nice car. There were 2 THT darts ,is it this one or the other THT car that was converted to 70-72 body trim , thought I saw some pre resto pics of this car when it was greyish silver and black maybe?It was definately in 68 configuration in those pics and looked like it had been for quite some time as it looked very tired needing full resto , was it converted back to 68 trim along time ago or is this the other THT dart? Last edited by hemitime; 10-10-2018 at 06:48 PM. The car I owned was the dark blue 4 speed THT dart. When I got it, it was pretty hacked up and the 68 rear was cut off and 70/72 rear added then cut off and the 68 put back on. Inner fenders were gone, fire wall partially gone, trans tunnel partially gone. Fortunately when I bought it in '89 a lot of the hard to find stuff was with it. Original doors, front bumper, front fenders, seats, bases. I built a as close to accurate hemi motor and slick shifted 4 speed as I could. NOTICE: the breathers, plug wires, tach, coil/ignition, shifter, lock out and a ton of other stuff not shown. I sold it and it went to Switzerland in 1998 or 99. I can't remember. Last edited by Charlie A; 10-11-2018 at 04:12 PM. A local/regional automobile hobby-oriented magazine did a little write-up on my LO23 Dart and my 2018 Demon, playing up the angle of it being 50 years between the factory dragstrip monsters of the LO23 and the new Demon. The got a few things mixed up, but overall it was fun to see them do the story. I did end up running several 10.0x's, including a 10.01 in the Demon, with full interior and street drag radials, and DA of 2000. 9's will have to wait until next year now (and 8's will have to wait until next year for the Dart), since my local dragstrip is now shut down for the season. 3 Darts in this photo.